With the UK’s Digital Economy Bill set to be finalised today, new 5G microwave spectra are about to be released across the planet without adequate safety testing, writes Lynne Wycherley. Global neglect of the Precautionary Principle is opening the way to corporate profit but placing humans and ecosystems at risk, and delaying a paradigm shift towards safer connectivity. In Drowning in a Sea of Microwaves, the late geneticist Dr Mae-Wan Ho – a visionary voice who opposed GMOs – identified pollution from wireless technologies as a pressing issue of our times. Since the advent of radar, followed by mobile phones and dense WiFi networks, such anthropogenic radiation has sky-rocketed. Although it is non-ionising, and does not destabilise molecules directly, evidence of other harm has been growing since 1950s studies on radar workers. According to the updated Bio-initiative Report (2012+) by 29 precautionary scientists, effects on biology feature in several thousand, peer-reviewed papers. Yet troubling new findings rarely filter into the media. Or global Green discourse. Though many studies have reported ‘no significant effect’, research by University of Washington biology professor Henry Lai, and others, reveals that wireless-industry funding is far more likely to yield such findings. “Toujours ils créent doubte” (‘they are forever creating doubt’), explains former Luxembourg Green MP Jean Huss, whose research on the wireless industry inspired the Council of Europe to call for many precautions (2011), including protection of warning scientists, and wired internet in schools. But wireless-product marketing has a loud voice. Few of us realise that genetic effects and free radical damage – both disease risks over time – are the most common, cautionary findings. Device-crowded spaces, such as our peak commuter trains or all-wireless classrooms, may be creating a subtly toxic environment. Wide-ranging, oxidative harm to animals has been found from WiFi sources. And linked pre-diabetic and pre-cancerous changes. Ground-breaking work by biochemistry professor Martin Pall, Washington State University – winner of eight international awards – reveals a viable mechanism for such harm. But as with other ‘inconvenient truths’, it is going unheard. Life’s exquisite electro-physiology is still being discovered. Researchers at Bristol University reported in May that bees’ hairs are highly sensitive to flowers’ delicate EMFs. In controlled trials in Switzerland, bees reacted to mobile-phone signals with high-pitched ‘piping’: a cue to desert a hive. Other studies show that mitochondria, the tiny power houses in our cells, are at risk from our new EMFs. And that even DNA, in its delicate antenna-like structure, may be frequency-sensitive. The long-term, ecological implications of our new, anthropogenic radiation are not known. But peer-reviewed studies revealing harm to birds, tadpoles, trees, other plants, insects, rodents and livestock, offer clues. Biology professor Lukas Margaritis, at Athens University, for example, uncovered harm to fruit flies from just a few minutes’ exposure to our everyday wireless devices, including cordless phones, Bluetooth, and even digital baby monitors. Reviewing research, India’s Ministry of Environment and Forests warned that sensitive habitats may need some protection. The UK’s Digital Economy Bill, about to receive its final seal, has sensible proposals for increasing country-wide access to fibre broadband: a technology that does not, in itself, stoke microwave pollution, though wireless add-ons do so. But probe beyond the bill to Ofcom’s 5G consultations, and new EMF exposures emerge: part of global trend. The worldwide rush towards 5G or ‘fifth generation’ wireless rollouts is set to raise our pulsing pollution to new levels. Untested, high microwave frequencies are being lined up to increase bandwidth, automation, and usage – at great profit to the industry. These millimetre and centimetre waves, though too weak to heat us, may pose possible risks to our skin, and deeper surface tissue, including that of plants. High-density transmitters are envisaged. A troubling prospect for the many hundreds of patients seen by professor Dominique Belpomme‘s clinic in Paris: patients whose disabling symptoms from wireless technologies are supported by new brain scans and blood tests. A delegation of scientists have petitioned for such electrosensitivity to be recognised as an environmentally-induced illness, with an International Disease Code (2015). Pushing for fast rollouts, the wireless industry is also in conflict with the Internatonal EMF Scientists’ Appeal to the United Nations. Signed by 223 scientists from 41 nations, it calls for remedial action – such as new safety limits, wave-free zones, and education of doctors – to protect our DNA, fertility, and nervous systems, plus children and pregnant women, from growing wireless exposure. And from rising, mains-electricity fields. Signs that such caution may be needed are growing. The pulsed, polarized, microwaves used by wireless technologies pose more biological risks than smooth or natural waves. Weak millimetre waves have a known potential to increase antibiotic resistance: what ecological effects might they risk, perhaps, if used universally? Studies also reveal a risk to skin pain receptors. Published associations between radio–masts and skin cancers, though at lower frequencies, plus mobile-phone masts and EMF-sensitive cancers (Adilza Dode, Minas Gerais University 2013), raise further questions. In his summer press conference, Tom Wheeler – former head of the CTIA, the vast telecoms lobby- group, and controversial chair of the Federal Communications Commission – proposed unbridled “massive deployment” of commercial 5G transmitters, taking off in 2020. Anticipating “tens of billions of dollars” of economic growth, with US telecoms “first out of the gate”, he warned “Stay out of the way of technological development! Turning innovation loose is far preferable to expecting … regulators to define the future”. With no mention of health-testing, carbon costs, or corporate responsibility, the FCC voted unaminously to go ahead by releasing swathes of untested high frequencies for private sector exploitation – so setting a trend. To questionable ends: added to other issues, how will our communities be affected by addiction to 5G multi-stream videos? How will it impact our spiritual communion with Nature? Many American health activists, and cautioning scientists, are aghast. Dr Joel Moskowitz, director of community health studies at the University of California, warns “precaution is warranted before 5G is unleashed on the world”. Former government physicist Dr Ron Powell points out the plans “would irradiate everyone, including the most vulnerable to harm from radiofrequency radiation: pregnant women, unborn children, young children…the elderly, the disabled, and the chronically ill… It would set a goal of irradiating all environments”. This drive to mine the electromagnetic spectrum come-what-may has echoes of fracking, and other headlong trends. In Captured Agency, the Harvard ethics report on the FCC, and the wider wireless industry, Norm Alster exposes ruthless “hardball tactics”, supported by “armies of lawyers”, at expense to our health. Microwaves, Science and Lies (2014), filmed by Jean Hêches across Europe, exposes similar patterns that are driving our pulsed radiation to risky levels. Western “safety limits”, based only on high levels that heat tissue, far exceed those of Russia, China, and some other nations. Professor Yuri Grigoriev, long-serving chair of Russia’s non-ionising radiation protection body (RNCNIRP), warned the UK’s Radiation Research Trust “ionising radiation is monitored…[but] levels of non-ionising radiation are constantly increasing and ubiquitous: it is out of control … Urgent action is needed”. Stealthy pollution-raisers, such as the 5G Internet of Things – with 30 billion tiny transmitters forecast for 2020 – and also, sadly, wireless smart-meters [1, 2*], vetoed by the American Academy of Environmental Medicine, may run counter to a cherished Green goal: that of nurturing healthy environments. Can we manage our energy, perhaps, in more bio-sensitive ways? 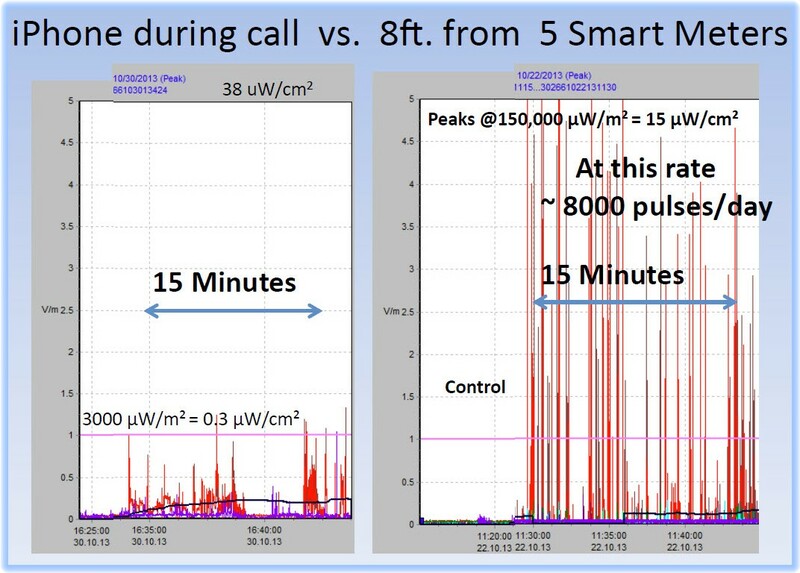 Court claims for wireless-meter health harm, supported by medical testimonies – including by neurology professor Andrew Marino (Louisiana) – are sweeping America. Professor Pall explains such meters’ “high intensity” microwave pulses may be more toxic than we realise: “We know from the nanosecond studies these can be very damaging”. Data obtained by a judge revealed all-hour, house-piercing pulses every few seconds. New data-over-wiring innovations (if free of “dirty electricity”) may offer inspiring, alternative ways forward. To create – in Wheeler’s phrase – a global ‘5G ecosystem’ of wireless super-saturated environments, at insidious risk, over time, to living ecosystems, not least our own bodies, is dysfunctional. And spiritually disturbing. It suggests a mindset deeply at odds with the orchid-like beauty of the Earth. But cleaner innovations, such as LiFi, ‘eco-dect-plus’ phones, and the latest fibre-optics, suggest a wiser course. A new paradigm – safer connectivity, plus more balanced use – is emerging. And reminds of other step-changes in awareness. From pesticides to organic, from smoke-filled to smoke-free. We can accede, if we wish, to our rising, planetary smog. To safety limits as high as the moon, in many scientists’ eyes. And to wireless rollouts’ growing carbon costs. Or taking pause, we may begin to call the industry to account – plus governments lulled by it. We may air helpful new findings, such as risks from tablet-like exposures (Alexander Lerchl, Jacob Bremens University, 2015). And stark risks from passive exposure, bared by Leif Salford, medical professor at Lund University. We may defend DNA, if we wish, from ionizing and published non-ionizing risks, just as we defend our planet. And alongside French Green Party MPs Laurence Abeille and Michèle Rivasi, plus the interntional Baubiologie movement, we can explore electromagnetic hygiene. Uplifting possibilities for a safer, cleaner world. Lynne Wycherley is a nature poet with six published collections. Working in parallel with pioneering doctors, she has been investigating non-ionising radiation for 5 years. ● Dr Mae-Wan Ho It seems fitting to begin with her voice, so well known in Green / holistic circles (inc. Ecologist), following the sad news of her death earlier this year. ● WiFi was also found to reduce growth/thyroid hormones in animals, and trigger aggression/a racing heartbeat, and cordless phones to retard root-growth, harm bee-hives, alter gene expression, and disturb the human heartbeat in blind tests (their stands produce harsh, all-hour microwave readings). ● Centimeter/millimetre waves penetrate less far, as you know, but with more energy. The pulse will increase bio-risks (re: 25 years’ data on pulsed v. pure sine waves). 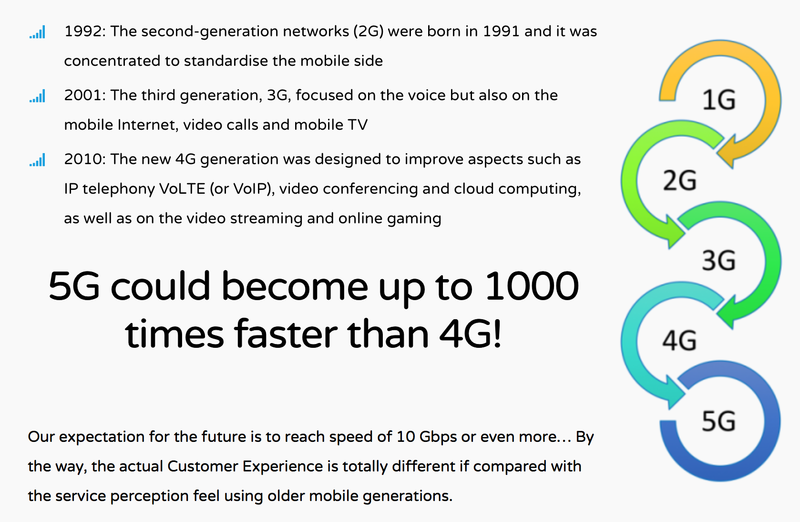 5G will be additional to 2G,3G, 4G. ● the CTIA International umbrella group now known only by its acronym; originally ‘Cellular Telephone Industries Association’ (Figures vary, but telecoms revenue is catching up with fossil fuels’, it seems). 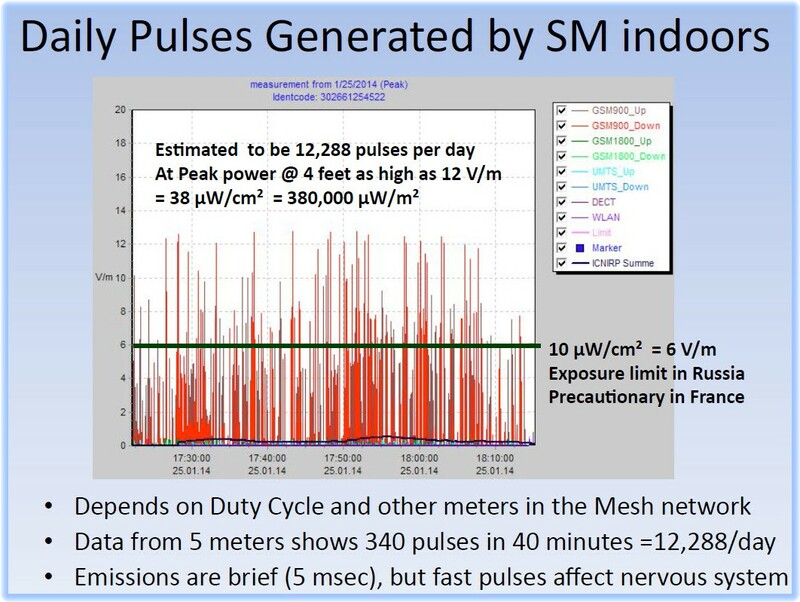 Wheeler: “Everything that can connected will be connected” – blanket electro-smog. This testimony, from journalist Amy Worthington (here) typifies so many known to me (even UK): “Cindy deBac (Arizona, new meter)…’ I’ve never been so sick in my life’, she says. ‘Nausea, a crushing migraine headache, and painful heart palpitations laid me low right away’. Healthy and exuberant before the installation, deBac…struggled with rashes and a chronically racing heart. For respite she spent nights away in her car”. Australian GP Federica Lamech’s peer-reviewed paper relates 92 such cases, herself included (sensitivity seems to vary, re: allergies). ● Professor Leif Salford (neurosurgery).Work on blood-brain barrier 1988-2010. Discovered passive exposure to other people’s mobile phones might risk serious, delayed damage. “Those who might normally have got Alzheimer’s dementia in old age could get it much earlier” Industry moves to fund diluting research were exposed in, e.g., Microwaves, Science & Lies.